Brother House's main floor is set up above ground level to maximize the forest views. Stairs leading to the deck and main floor. Lots of privacy and shade on the side deck. Plenty of room on the deck for enjoying a drink together... or enjoying a meal together. The hammock is a wonderful place to take a siesta or view the stars at night. We love to have guests share memories of their visit ! The Brother House is a beautiful cabin with an open floor plan, beamed cathedral ceilings, and floor to ceiling windows. View from the loft. Plenty of seating in the great room. Take time to catch up with family and friends in evenings. The dining table seats eight comfortably. One of two master suites on the main floor with a queen bed. All bedrooms are beautifully appointed. A second view of one master suite and the deck. Second master suite on the main floor also has a queen bed. The loft area offers more room to relax and viist. Third bedroom is on the upper level with two twin beds and a private deck. 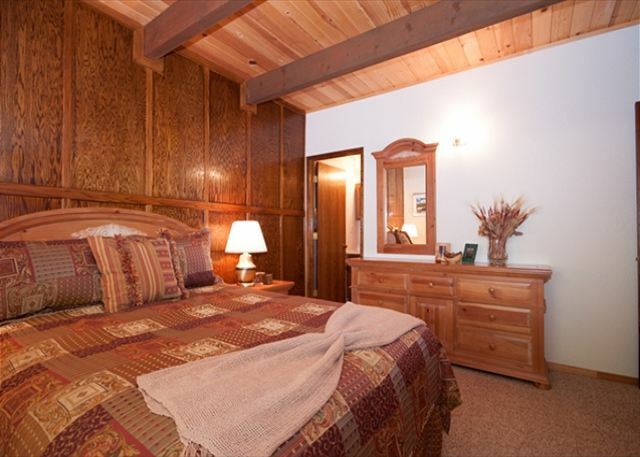 Fourth bedroom is also on the upper level and has two twin beds and a private deck. 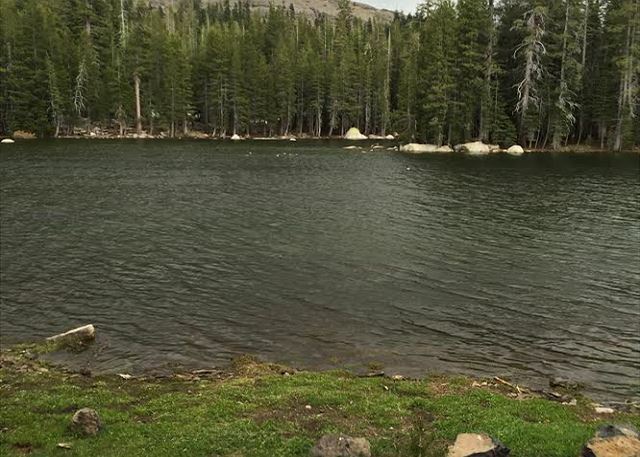 Explore alpine lakes just up the hill. Hikes and views abound in Ebbetts Pass. ALL CABINS HAVE A HOUSEKEEPING CHARGE AND COUNTY TAX IN ADDITION TO THE RENT. 3 Night Minimum During Holiday Periods. 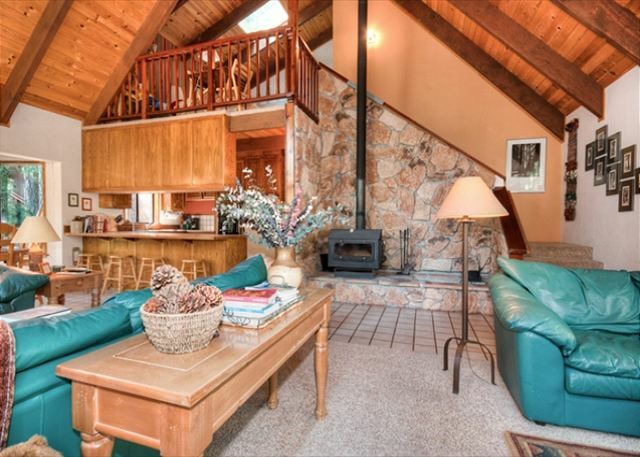 Lovely 4 bedroom Chalet style cabin features two master suites, use of garage for 1 car, a loft and high ceilings. The cabin has central heat as well as a wood burning stove and backs up to Big Trees State Park. 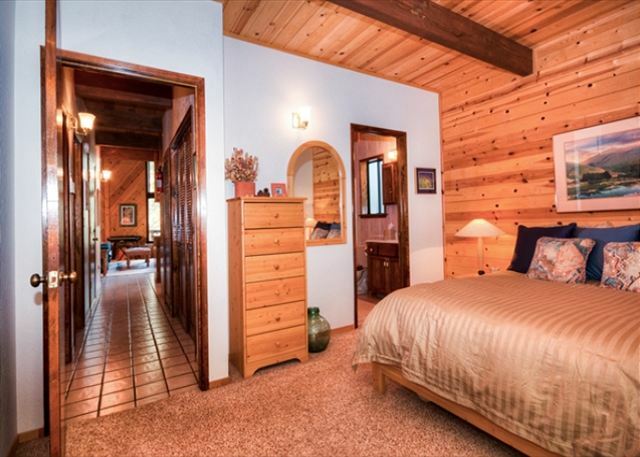 Both master bedrooms are on the main floor and each have a queen bed. Two more bedrooms upstairs have 2 twins in each. This is a great home for 2 families! Comcast basic TV cable and internet also available. Cabin rental includes summer access to Fly-In Lake and Blue Lake Springs recreation center (guest fees apply). Propane BBQ for guest use. 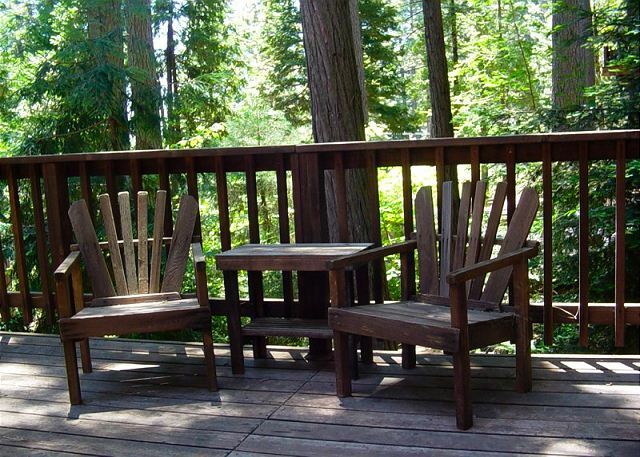 The home is a short distance from Calaveras Big Trees State Park, Bear Valley Ski Resort, fishing, swimming, hiking, sledding, skiing, and much more! No smoking, no pets. Linens provided. Our whole family rents this cabin every summer--it's a tradition. Thank-you Margarita for coming to stay with us again as our guest at the Brother House Cabin. The Brother House cabin is a wonderful cabin. We hope to see you again next year! 2 families (4 kids, 4 adults) fit in beautifully and we were happy tp see how well stocked the chalet was. board games, condiments, its all there. the only downside is the oven has only one shelf and the outside song had a bit of green tape on it - we assumed (rightly) it was out of action but if its unsafe remove it! really felt lived in - in a good way! very spacious. thanks all! The swing was taped off so guests will not use it and has the tape around it for this very reason. This is a wondrful cabin enjoyed by many frequent visitors. Thank-you for staying at the brother House as their guests. We had a great experience. We spent a long weekend there and had a lovely and peaceful time there. The cottage is spacious and beatiful with nice view in a great place. Very convenient for day trips to caverns, Calveras Big Trees and hiking! We loved this cabin! The view from the windows in the living room is spectacular! The kitchen was well equipped and it was so nice there were fans in each bedroom. We loved grilling on the deck and relaxing in the hammock on the side of the house. It was so clean and fresh feeling. We all enjoyed our stay at the house. It had everything we needed. Working with Big Trees Real Estate made our difficult trip smooth and worry free. Thank you!! Thank-you Bonnie. Please come back and stay with us again! The brother cabin was perfect! The location was great, the cabin was spacious and to our delight the cabin had a big chest full of toys! Since we were traveling with a few kids it was so nice that there were toys there to entertain them. The kitchen was well stocked, and the appliances worked well. The rooms were very spacious and we liked the room to bathroom ratio. It was perfect for the size group we traveled with. We would definitely stay at the brother cabin again! It's very close to blue lakes springs so we look forward to visiting in the summer! Our vacation was amazing !! !, thanks to the comfortable house and outdoor activities. The house well maintains and has everything that you can think of. The only small suggestions if you can change the policy for the dishes should be clean and placed to original place to dishes should be place into dishwasher and start dishwasher (or leave dishwasher off). Otherwise people should wait at least for an hour till disses done to place them back to the cupboard. Everything else was perfect and smooth. Yelena Kirshon and all the guests. Thank-you Yelena. We hope to see you again sometime. I will discuss your request with the cleaning contractor in regards to the dishes for this is their requirement not ours. We enjoyed our stay at the Brother House. Since it was the night of the opening ceremonies of the Olympics, we wanted to watch. The TV was super small and there was no way we could all see the small screen. That was the only complaint with the facility. The beds were very comfortable and the cabin was clean. It had plenty of room for us and was very convenient to the lake and clubhouse. We are glad these guests enjoyed your stay at the Brother House cabin. Sorry for the TV problem. It was unfortunate that the Comcast box on the large TV malfunctioned and could not be replaced before these guests stay. The sierras have no Comcast location nearby to pick up a new box, it has to be mailed. Besides the TV malfunction I am glad to here these guests enjoyed their stay. This is a wonderful cabin with lakes and hiking trails nearby. We hope these guests return to stay at the Brother House again. This house was close to ideal for all eight of us. We were visiting, with twenty other friends, for an annual golf tournament, which made the location in Blue lake Springs ideal if a little difficult to find. The home was perfectly suited to our needs except the lack of air conditioning. We were aware of this before we rented but, it might be the only reason we will not confirm, right now, for next year. We did appreciate the big box fans in the bedrooms. If I were to really nit pick: the fridge was not cold enough for drinks; the kitchen lights could have been brighter; more than one soap dispenser per bathroom would have been handy. There I said it but, none of these minor inconveniences, in any way, spoiled the weekend. Thank-you for the review in regards to the Brother House cabin. This is a delightful, comfortable cabin. Many guests returning to stay here every year. It was unfortunate for the warm weather we experienced the week of their stay which is not typical for the sierras. Air Conditioning is not something needed often at all in our sierra cabins. These were delightful guests, enjoyed meeting a good portion of the group. We hope to have them return again next year to stay at the Brother House cabin and will consider all of their comments. The house was wonderful and the management was very friendly and helpful - definitely recommended! Great house to share between two families. Thank you for your review. The Brother House is set up in such a way as to accommodate two families with children. The home has 2 master suites with queen beds on the main floor and two upstairs bedrooms with two twins each. This is an ideal set up for two couples with children and the owners have also taken care to stock the house well with games, movies, and kitchenware. We are glad you enjoyed your time at the cabin and hope to see you in the future! We have been coming to the Bear Valley area for over 20 years and have always rented. We have a large party of 8. All adults now as our kids are all grown. The Brother house is nice. However, if you plan on doing a lot of your own cooking this is a tough kitchen to work in. No place at all to store your food. We were left to keep it packed in bags and placed it on the washer/dryer. Not convenient. There werer no cookie sheets or crock pot. The bedroom space and living room space is good. The kitchen, dining and partial living room need new tile as the existing tile is terribly cracked. Other then that we enjoyed our stay. For as long as we have rented this beautiful cabin we have never had any complaints about the kitchen space or supplies. The overall kitchen supplies are plentiful with a good mix of pots, pans, dish ware, etc. A crock pot is not something that is standard in our rental cabins, however, there is one at the Brother House cabin? We would have gladly accommodated these guests with any reasonable items needed. We will certainly let the owners know this guests recommendations. This is a clean, well kept cabin, maintained to the highest standard by the owners and our staff. The home was truly beautiful, with its high windows and quiet woods surrounding it. We loved walking around the neighborhood, as well as exploring the beautiful hiking available in the area.There was a view to the neighbors from the back bedrooms, but they were not loud. The kitchen was full of tools to cook meals, the cupboards a bit jammed but abandon. Not a lot of space in the cupboards to put our food, but we moved things around a bit to accomplish this. The place was LOVELY to spend time, to cook, to eat on the deck. We will surely enjoy this property again in the future! The Brother House is one of our best homes in Blue Lake Springs, and the owners take great pride in providing a comfortable property for guests. We are glad you enjoyed your time in this beautiful home! The Brother House was everything we hoped it would be! The owners clearly take immense pride in the property. The atmosphere was cozy and made us feel right at home. There was enough space for people to curl up and read when they wanted, or meet at the big dining room table for meals, games or chatting. We enjoyed our day trips to Big Trees State Park, Murphys and White Pine Lake. It was a little difficult to find the first night in the dark but your directions were perfect! We enjoyed the casual atmosphere and comfort. Just the right amount of room for 4 couples. I think they just need to work on the sliding glass door a little bit but I know how that is! Yes, this is a wonderful cabin liked by many families. Comfortable and well taken care of by our owners. A flashlight to find a cabin at night is a must for we do not have street lamps like the city, only the stars to guide us. The sliding door handle is being repaired by the owners, sorry if this was a problem. We were very satisfied with our 7 day stay at Brother House (Bernstein) 4 bedroom,4 bath. Beautiful, well maintained, secluded House high in the mountains. Would stay there again and would recommend it to family & friends. Thank you for sharing your Vacation Rental with us! Everything was perfect from the original phone call to rent the cabin to returning the keys. The cabin was clean, the accommodations were exactly what we needed for our family, and the views were spectacular. We are so pleased to hear that you enjoyed your stay! The Brother House is certainly a gorgeous rental, and very well-appointed and fabulously located. I rented this cabin for 8 friends, all males, taking a weekend to have a relaxed, fun time away from our families. Some of us had to share a bed, and otherwise the cabin was spacious and perfect. It's close to some great hiking and the cathedral-like roof structure with high ceiling is really nice. The house was clean and comfortable. The location was close to Arnold and a little too far from Bear Valley Sky Resort. This cabin is approx. 45 mins. to Bear Valley Ski resort. Easy drive up the scenic Ebbetts pass corridor with no city traffic to deal with. This cabin is located in the Blue Lake Springs/Arnold area with a very short drive to Big Trees State Park and only minutes from the Arnold Rim trail or White Pines Lake. A easy 15 minute drive down the highway will bring you to the historic town of Murphy, where you can wine taste and enjoy fine dining. 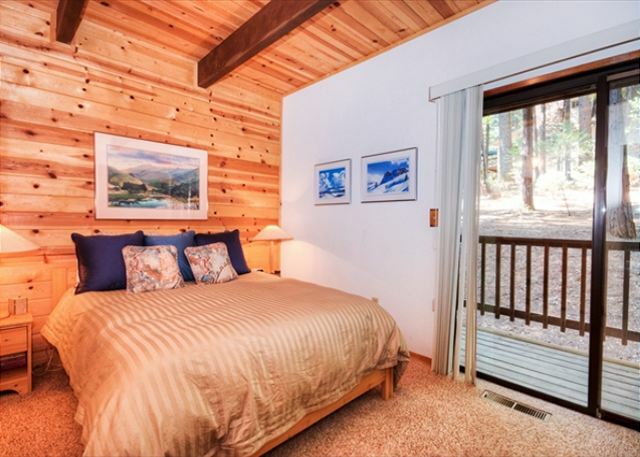 Centrally located to many attractions, this cabin is the ideal get-away in the Sierras. It was great experience to stay at such a neat and clean cabin. My family and friends loved the location and beautiful views. The Brother House is certainly one of our nicest properties in the Blue Lake Springs area. From the large living room, cathedral ceilings, two master suites, and beautiful location backing up against Big Trees State Park, what is not to love? We are so glad you enjoyed your stay and hope to see you again! The house was great! It had everything we could possibly need down to toys for the kids. We really enjoyed our stay!! Thanks for your comments! The Brother House is a fantastic rental and is very well stocked. We are glad you enjoyed it! The house we stayed at was wonderful. We had random power outages during our 2 day stay, which was beyond anyone's control. My disclaimer would be that there is close to no cell reception and the property management office was not in the office the entire weekend and never answered their office or cell phones. This made getting answers to questions difficult and delayed. The lock box with keys was also unlocked all 3 times I used it, which raised security concerns. Our area is very rural, which is one of the biggest attractions and reasons that people come up to escape from the hustle and bustle of city life. Lack of cell reception tends to go hand in hand with rural and heavily wooded areas like ours. The fact that there is no cell reception in the area is stated very clearly in the rental contract that guests are required to sign when making a reservation. We are often out showing properties to real estate clients and taking care of cabin business and ask that guests leave a message whenever calling the office if there is no answer, for we respond in a timely manner to all messages we receive. If no message is left, we cannot return it. Regarding the lock box, it is locked upon our staff leaving the office. It is possible for other late arrival rental guests to leave the box unlocked after picking up their packets, which, unfortunately, is not something we have control over, though we do ask guests to lock the box after picking up their keys. We have never had an issue with security in that regard. This was a wonderful vacation rental. The owners have considered everything and it really felt like a home away from home. 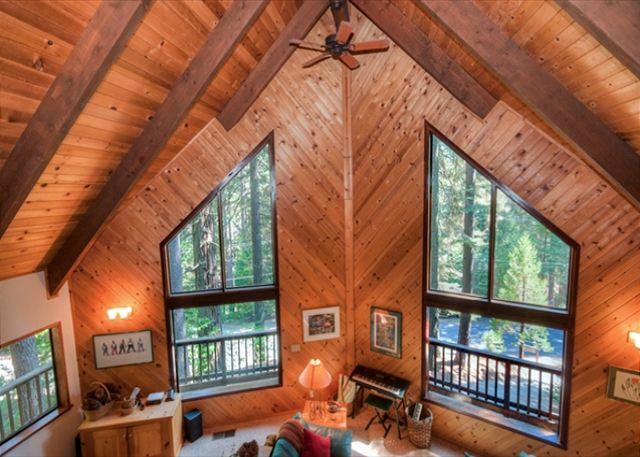 This home had beautiful architecture with large windows facing the pine trees. It easily accommodated our family. We spent time at the lodge pool and lake, which was also great. It was a short drive to the lodge and to calaveras big trees. The only recommendation I have is the swung on the porch was broken and I would recommend fixing it our replacing it. Thank you for your review. The Brother House is certainly very well appointed and has absolutely gorgeous views of the trees, as it backs up right against Big Trees State Park. We will let the owners know about the porch swing. We hope to have you back! This place is great! Lots of space, comfortable beds and living conditions. Big Trees Realty was excellent to deal with. My only suggestion is that there needs to be a garbage can in the kitchen. Great place, great time, sleepy town, and they like Canadians, what more could one want!